Want to try a sport that is flexible, fun to learn and you can do with friends or on your own? Give clay target shooting a go. 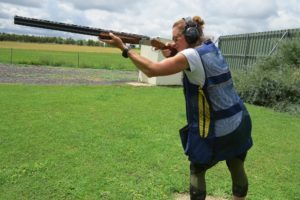 The Wangaratta Clay Target Club is inviting women and girls (12 years and over) to learn clay target shooting on Tuesday evenings at 5:30pm-7pm from 5 February 2019 to 12 March 2019. It costs just $17 to participate each week. You need to wear closed toe shoes and some eye protection (sunglasses or cheap safety glasses are fine). The club will supply everything else, including guns, ammunition, targets and ear plugs (or you can bring along your own ear muffs). Register here and we’ll see you there. This program is supported by VicHealth’s Regional Sport Program. This entry was posted in What's On Offer for Sporting Clubs and Active Recreation by Sport North East. Bookmark the permalink.